It was daunting to whittle down thousands of pictures and a year’s worth of memories to a reasonable number. Hopefully, this shortened list won’t challenge your attention span but here are some of our favorite places from a wonderful year in travel. In all, we flew some 84,000 air miles; visited 10 countries, took four cruises (two on riverboats and two on ocean liners); and made a road trip between New York and Charleston with stops along the way. We still had time for a relaxing month at home at the end of the year. We were blessed with good health, the love of family and friends and wonderful opportunities to travel. We wish the same to you for the coming year! We spent three weeks in this charming city that is so richly influenced by the culture of the South and its proximity to the water. We were here to attend the Cancun-Riviera Maya Wine & Food Festival but were again captivated by the beautiful colors and warmth of the Mexican people. We arrived on King’s Day when the canals are filled with revelers and the entire city seems to be painted orange. Our tulip cruise took us to two of the most famous tourists attractions in the country, the windmills at Kinderdijk and the spectacular Keukenhof gardens. We learned about the history of whaling just in time for the release of In the Heart of the Sea, which is set in this town with a long whaling history. 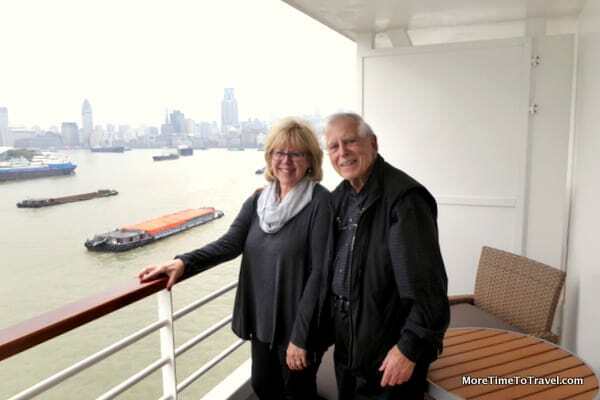 Our cruise in China stopped at both Shanghai and Beijing with excursions to two UNESCO World Heritage Sites, the Great Wall and the site of the Terracotta Warriors and Horses. Both these cities felt like they could be backdrops for fairytale stories. We absolutely fell in love with this vibrant city of hills, which was reminiscent of San Francisco. How fortunate we are to have friends who live in Tuscany, and who love sharing the beauty of the art and countryside with us. Quite a different lifestyle than the one we are accustomed to but interesting to view close up and from the deck of an ocean liner. The largest seaport in Italy with a rich maritime history offers an interesting cityscape. The town of Orvieto seems to rise out of the cliffs. We also had the chance to drive through the region of Umbria and admire its breathtaking landscapes. When our son headed West to work in the Silicon Valley last summer, it wasn’t long before we made two trips to see him, one of them to transport his cat and the other to attend Google Take Your Parents To Work Day. Our last trip of the year was a river cruise that took us to one of the most famous wine-growing regions in the world. The food wasn’t bad either! How fortunate we are that we are always as happy to return home as we are to go away! Bravo on a fabulous year of travel, captured in this lovely photo essay. Thanks! Thanks, Josie! It’s been great getting to know you and read about your housesitting adventures. Thanks for sharing these great pictures which bring back some wonderful memories for me also. Have a wonderful 2016,filled with many more happy travels! Thanks for following my blog, Lauren! Wishing all the best for the New Year to you! Wow, 84,000 miles! Always fun to read these recaps of the past year. Here’s hoping 2016 is even better! I have thoroughly enjoyed becoming part of your world! You experienced a stellar traveling year! I have been to a few of the cities you visited and some of them I want to go to because of your descriptions and photos! Happy New Year Irene! Thanks for your warm wishes! Hoping you and the family have a wonderful New Year! Wow! You’ve been to a lot of places in 2015! I had to zoom in on the colourful tables in Mexico as I didn’t know what I was looking at, at first. Nice picture. Two places you visited that might be on the horizon for me would be Lisbon in March and China in the Fall. I may look into a cruise like you have done. Would love to help if I can! Thanks for sharing your 2015 pictures. I look forward to following your 2016 adventures! And next time your planning a trip to the Netherlands, let me know beforehand and maybe we can meet up and I can play tour guide! What a fabulous year you’ve had Irene. You’ve certainly been to some exciting places. Fabulous photos too! All the best for 2016. I’ll be following along to see where the year takes you! Thanks, Jenny! Wishing all the best for a great New Year for you! 2015 looked like an amazing year for travel and experiences for you and I loved reading your recap of some of it’s high points (I’m sure there were many more!) as well as seeing a few of your photos.I can imagine what a task it was to sort through your pics and pick out just a few. Here’s wishing you an even more spectacular 2016 loaded with just as much travel as you want. And maybe our paths will cross along the way. It has been a pleasure ‘traveling with you’ during the last year and look forward to the adventures you will take us on in the coming one! Happy New Year and Happy Travels to you, Irene! Hope one of these days our paths will cross. Happy New Year! Wow, what an amazing travel year and experiences you had! You captured some great photos and moments. Looking forward to what 2016 travel will be! How amazing to see how many wonderful places you visited lat year – loved taking the trip with you through Jerry’s beautiful photos. Welcome home…and bon voyage, as I know your suitcase is probably already packed for your next adventure! Hope we have the opportunity to travel together this year! Three continents in 84,000 miles! We did 16 countries but only in Europe and North America. We would like to go to China on that tour you took because it covered the most important destinations! The China trip was an incredible experience! Hope you get there too! I was shocked at how long it took me to do my “our year in review” post and choosing photos was one of the more difficult parts. I look forward to virtually tagging along on your 2016 travels. Best wishes for a healthy and happy 2016. Write on! Yes, we took thousands of pictures and looking through them was both a joy and tedious! Best wishes back at you! What a year! Here’s to more great travels ahead for you in 2016. We also visited Lisbon and Tuscany in 2015. Loved the art of Pietrasanta — very striking, isn’t it? Wouldn’t it be great if we were ever in the same place at the same time? Wow you really got around in 2015, looking forward to following your travels in 2016. Happy new year! Wow! That’s a lot of miles kiddo. Hope your travels bring you to Chicago in 2016 we definitely have lots of choices for really great food and travel experiences. Wow, what a lot of ground you covered in 2015. I hope if you get back to Nantucket, we will have the opportunity to rendezvous! Your photos of Orvieto are positively dreamy! Can’t wait to see what you have on tap for this year’s destinations.